Lately, I’ve been thinking about Minecraft, a 3D exploring/digging/building game that has been receiving a lot of attention lately. I first started playing Minecraft about a month ago, and it was clear after two days that it would consume my every waking hour if I let it. I put some self-imposed limits on how much I could play it, with modest success. After 10 days, a painful-yet-fortuitous glitch deleted my world, and I used the opportunity to try to pry myself away from the game. Yet, even though I haven’t played it in over three weeks, I still feel an urge to play it nearly every day. There is something about its creative, free-form play that is incredibly attractive, even addictive. Meanwhile, I have my own OpenSim region where I can create and do anything I want, yet it sits neglected for lack of time, interest, or motivation. Why this stark difference? Why is Minecraft, the more limited and less creative of the two, the more appealing? And what, if anything, can I do to harness the creative drive that Minecraft inspires, and channel it into my OpenSim region and other projects? Yesterday, April 22, was my fourth rezday. It was four years ago yesterday that I logged in to Second Life for the first time, and the persona of Jacek Antonelli was born. Yesterday was also the last rezday I’ll be celebrating in Second Life. 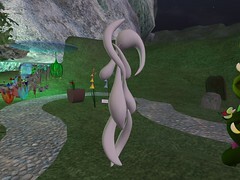 A recent culmination of circumstances has pushed me away from Second Life, and triggered my migration to OpenSim. I’ll be wrapping up my affairs over the next month, then putting my Second Life account on the shelf. By this time next year, I expect SL to be mostly irrelevant to my day-to-day life. I’ve counted Dusan Writer as a friend (or at least a friendly acquaintance) ever since I met him in the course of his UI design contest a year ago. He’s an interesting personality, and generally an intelligent fellow and a thoughtful writer. So, it’s with some disappointment that I read Dusan’s recent post on Second Life’s permission system. His post is prompted by the progress of VWR-8049, a proposal to allow users to choose the default permissions for new objects that they create. Dusan comes out strongly against it, and although I’m firmly in favor of it, that’s not the disappointing thing; I don’t mind people disagreeing with me. What disappoints me is that Dusan has bought into the baseless FUD that certain individuals have piled onto the issue. Alas, not only does Dusan believe the FUD and let it color his entire analysis of the feature, but he also regurgitates it in a most unsavory and uncharacteristic manner, littered with baseless attacks, ranting nonsequiturs, and flawed thinking. I’m usually content to let this sort of thing lie, but it boggles my mind that FUD of this sort could spread when it has so many holes in it.